When to take Amino X? Currently, the number of supplements is so large that they are very easy to get confused. 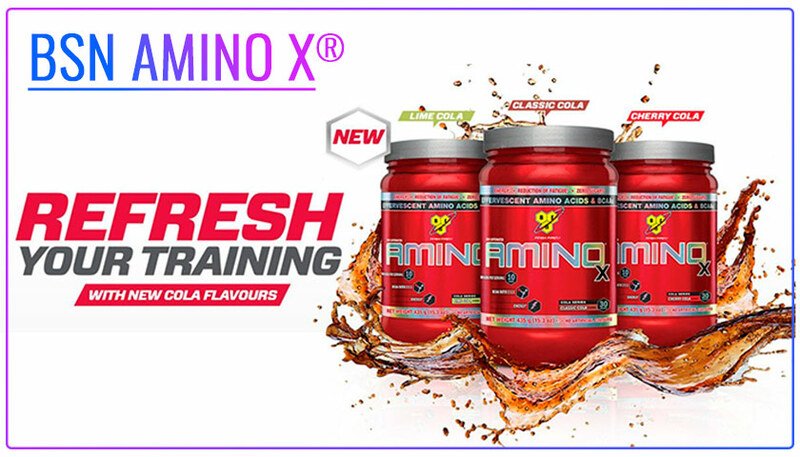 In this post we have prepared BSN Amino X Review. This Supplement combines BCAA, vitamin D, and sugar-free essential muscle building blocks and catabolism. In our review, we will look at the composition, advantages and possibilities of use. One of the advantages of this Supplement is a good choice of flavors. Amino X dissolves quickly and easily, all the flavors I had a chance to try were amazing. The following flavors are available: Classic Cola, Watermelon, Lime Cola, Green Apple, Cherry Cola, Blue Raspberry, Fruit Punch. Each serving of this Supplement contains 10 grams of Amino Acids Per Serving with the classic 2:1:1 essential amino acid formula. These amino acids are the main material for building muscle fibers in post-workout recovery. For consumption, 1 scoop of AMINO X is mixed with 180-200 milliliters of cold water or any other beverage. Some also add glutamine when used after a workout or creatine when used before a workout. The amount of BCAA in each serving is 10 grams. The ratio of the basic amino acids L-Leucine, L-Valine, L-Isoleucine classic 2:1:1 allows them to fully absorb and perform their tasks to restore muscle fibers and prevent catabolism. The amount of BCAA used per serving will be sufficient for recovery, but we will not close the daily rate. It is optimal to take this Supplement together with a full diet consisting of at least 5 meals with a regular presence in the diet of different types of protein, complex carbohydrates. In addition, for greater effectiveness of this Supplement is recommended to drink 3 – 4 liters of water daily. The composition includes vitamin B6. It supports energy metabolism in the body and helps reduce fatigue. Therefore, many people prefer to use the Supplement during training. Amino X additionally contains Taurine. This component is not used as a building material. But it takes part in the synthesis of a large set of amino acids, improves metabolic processes in the body, improves energy and reparative processes. At the cellular level, Taurine restores the function of cell membranes. There are several versions of the optimal time of taking this Supplement. In my personal experience, it is optimal to use this Supplement before and during training. It gives energy for training, perfectly quenches thirst and increases efficiency of muscles. Although the composition does not exclude the use of Amino X between meals and even in the evening. It is not a pre-workout complex, does not contain caffeine or other similar supplements that stimulate heart activity or stimulate the Central nervous system. The optimal effect of the use of this Supplement appears when used for 3 weeks. After applying this Supplement for 12 weeks is to take a break for about 1 month. In fact, it is optimal to try this Supplement and determine how it will suit you. Some users prefer tasteless additives. Try Amino X before and after your workout. Compare your performance in training and recovery period. DOES AMINO X HAVE CAFFEINE? There is no caffeine in Amino X. But the available components increase performance during training. WHAT DOES AMINO X DO FOR YOU? Personal experience can be noted a more rapid recovery after workout and increased muscle endurance. This is not a classic pre-workout complex from which everything boils. But the energy is added and I can carry out training with good intensity. When I pause there is no special decline, as the additive has a cumulative effect. This Supplement can be used before training to prevent catabolism. During and immediately after exercise for good recovery and growth of muscle fibers. WHAT ARE THE BENEFITS OF TAKING AMINO ACIDS? The use of such BCAA supplements can compensate for the deficiency of these amino acids at the right time in an easily digestible form. From plain food such substances is not possible to obtain in a timely manner. AMINO X is an excellent Supplement containing a good portion of BCAA. Effervescent composition is easily mixed with water and has a great variety of flavors. The composition gives a significant effect, improving performance during training, reducing catabolism, accelerating the recovery process. Suitable for both beginners and more experienced athletes. I used Amino X for a long time with breaks when actively training in the gym. I think this Supplement is very high quality and effective. I can recommend it for use. It is perfect for all beginners.